For day four what really could we have apart from a full rundown on everything about the four. 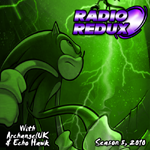 Yes, Sonic The Hedgehog 4 Episode I. We’ve a double header in more than one sense with both a Radio Redux show from the week of release (#529: The Phantom Menace Show) and not only that but we’ve (finally) got Sonic Wrecks’ review of Sonic 4 up as well. Blake Draco tells it like it is from his point of view, whilst the SW Crazed Fanboy prepares another response filled with venom… and something else – sawdust I think – or the official review and we also have the full version of Urtheart’s (somewhat controversial apparently) review from Emerald Coast as an interesting counterpoint.